But there are mounting unionist fears that the inquests will be used to legitimise IRA terror and put police and soldiers on trial. 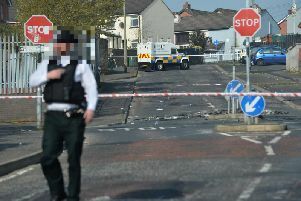 It was when files were forwarded to the Attorney General John Larkin on the shooting of an IRA killer Joe McCann, whose relatives wanted an inquest, that he forwarded it to prosecutors. They charged two soldiers in their 60s with murder. An inquest into another shot IRA terrorist, Pearse Jordan, led to two retired RUC men being reported to prosecutors. The answer from a party spokesman declined to rule out inquest funding: “There has been an unfair and disproportionate focus on the actions of the state despite the fact that 90% of deaths during the troubles were caused by the criminal acts of terrorists. This is unacceptable and our approach is to ensure a fairer and more equitable way of dealing with historic cases. “The DUP does not support a piecemeal approach, but we want to see a comprehensive way of dealing with the past.